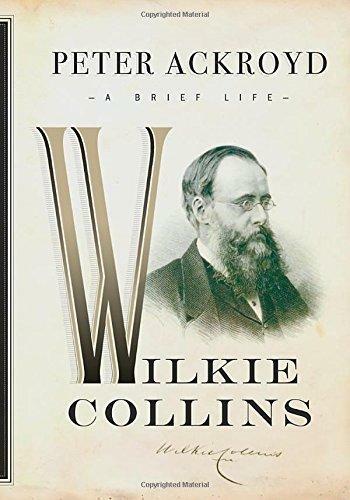 A gripping short biography of the extraordinary Wilkie Collins, author of The Moonstone and The Woman in White, two early masterpieces of mystery and detection. Short and oddly built, with a head too big for his body, extremely near-sighted, unable to stay still, dressed in colorful clothes, Wilkie Collins looked distinctly strange. But he was nonetheless a charmer, befriended by the great, loved by children, irresistibly attractive to women—and avidly read by generations of readers. Peter Ackroyd follows his hero, “the sweetest-tempered of all the Victorian novelists,” from his childhood as the son of a well-known artist to his struggling beginnings as a writer, his years of fame and his lifelong friendship with the other great London chronicler, Charles Dickens. As well as his enduring masterpieces, The Moonstone—often called the first true detective novel—and the sensational The Woman in White, he produced an intriguing array of lesser known works. Told with Ackroyd's inimitable verve, this is a ravishingly entertaining life of a great storyteller, full of surprises, rich in humor and sympathetic understanding. Peter Ackroyd is the author of London: The Biography, Albion: The Origins of the English Imagination, Shakespeare: The Biography, and Thames: The Biography. He has written acclaimed biographies of T. S. Eliot, Dickens, Blake, and Sir Thomas More as well as several successful novels. He has won the Whitbread Book Award for Biography, the Royal Society of Literature's William Heinemann Award, the James Tait Black Memorial Prize, the Guardian Fiction Prize, the Somerset Maugham Award, and the South Bank Award for Literature. His last book was a brief biography of Charlie Chaplin. How did Wilkie Collins help shape English literature in the 19th century? During Wilkie Collins’s time, it was popular to serialize novels in weekly journals. How successful do you think serializing books would be today? Wilkie drew a lot of mannerisms and social interactions for his characters from riding the “omni.” Where would be the best place to make these observations today? After coming from a family of artists and poets, Wilkie Collins was said to have a “painter’s eye.” How did art affect his life and his style of writing? Wilkie Collins was believed to have been a “pioneer” in the re-creation of the female character of English literature. What effect do you believe his varied relationships with women over his lifetime had on the heroines in his novels? Wilkie Collins often gave his characters physical abnormalities and would make his female characters seem more masculine while the men would appear more feminine. Why do you think he did this? Wilkie Collins was once described as “the novelist who invented sensation.” His novels were concerned with family secrets, seductions, bigamies, murders, finding drama in the suburbs and “causing the Hair to stand on End.” What are some versions of entertainment today that focus on “sensation” as a form of storytelling? What sort of effect do you think Wilkie Collins’s illnesses had on his writing? Two of Wilkie Collins’s best novels, The Woman in White and The Moonstone, were written with multiple narrators telling the story and giving their own accounts of what happened. Do you believe this style of narrative was what made these two books his best? Why do you think Peter Ackroyd was interested in the life of Wilkie Collins and decided to write a biography on him?